…and then you add some more butter. 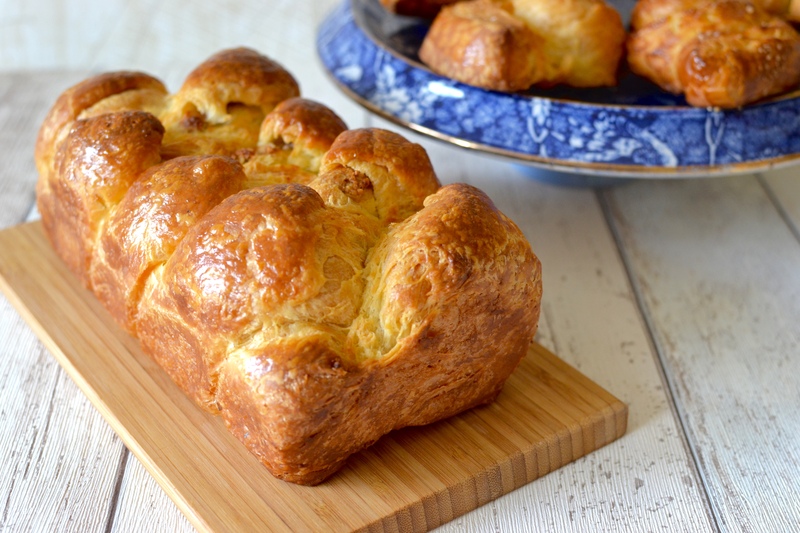 Do you like Brioche? Do you like its buttery, rich yet light, texture in your mouth? Is it possible to improve upon Brioche? Yes, it is! And the answer is to add more butter. It doesn’t seem possible. What is more, it seems unlikely that by adding even more butter to this already rich *and* enriched dough you can make it lighter. The trick is doing it in layers, or laminating. 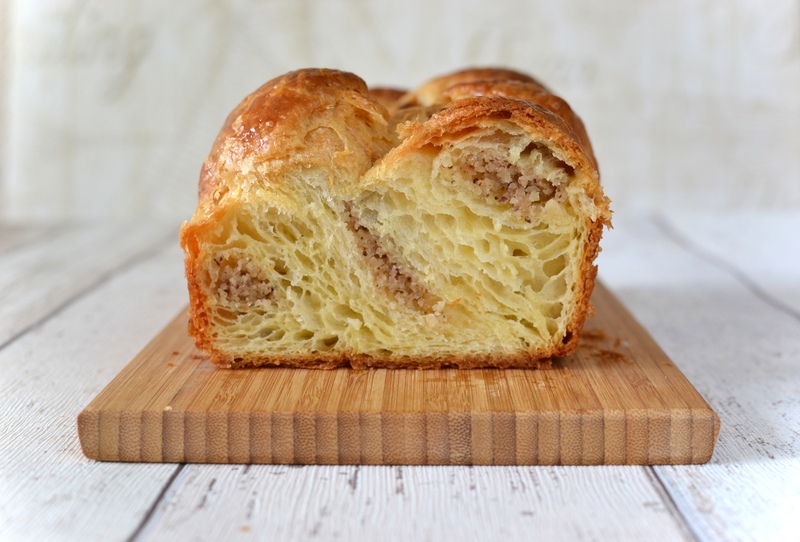 Brioche Feuilletée is made using the same method as croissant or Danish pastry dough, or puff pastry: the dough is rolled out, folded, then chilled several times, until many layers, sheets, leaves or feuilles of alternating thin dough and butter are created. 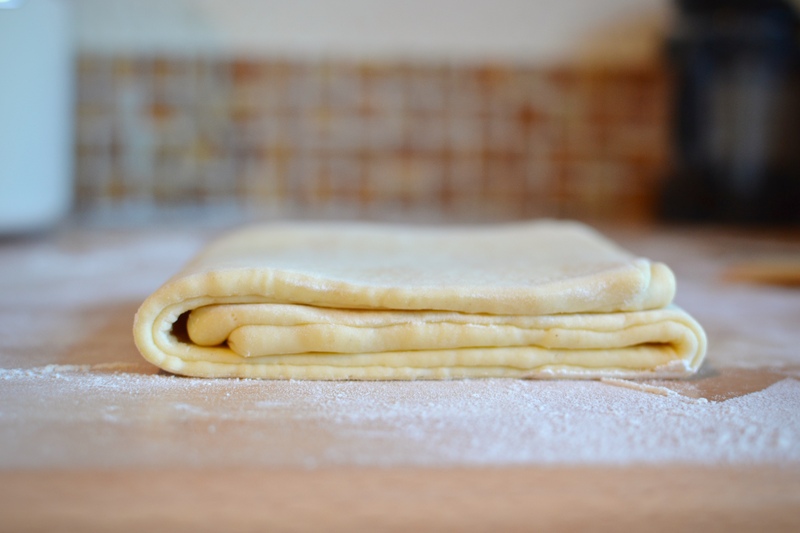 I made Brioche Feuilletée last weekend for the first time and I decided to document the process in several photographs that I would like to share with you now. 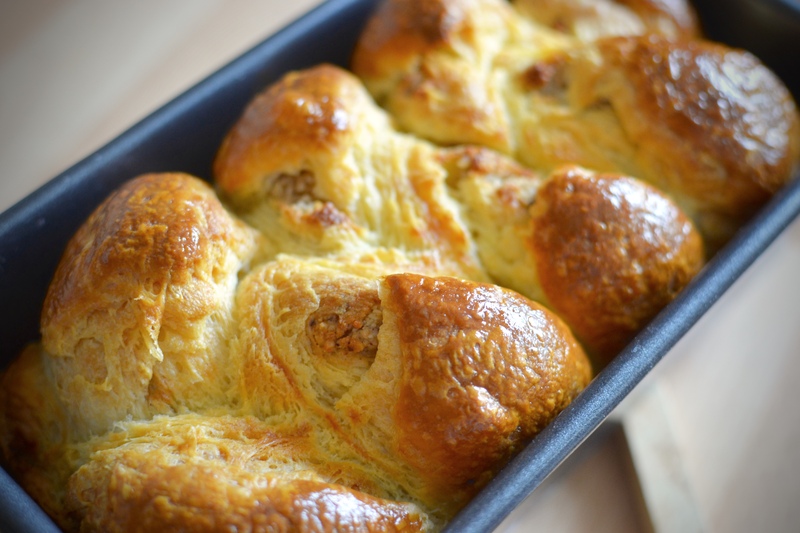 Having used Michel Roux’s Brioche recipe before, and been very happy with the results, I decided to start there. This recipe makes 1.2kg (actually more than I needed) and I made it the night before I wanted to make the bread, allowing it to firm up and prove slowly in the fridge. 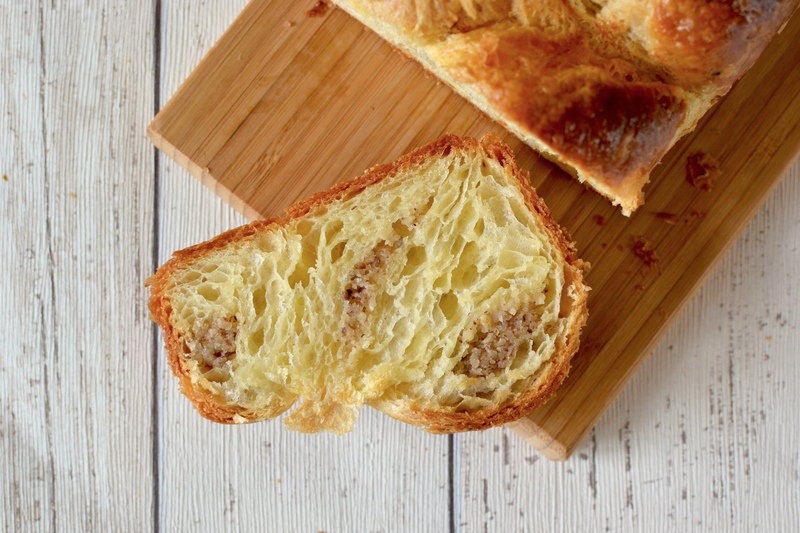 I turned to my latest purchase, Bread, by Jeffrey Hamelman for a Brioche Feuilletée recipe. He asks for two quantities of 300g of brioche dough (so half of the original dough ended up in the freezer for a quick brioche fix in the near future). 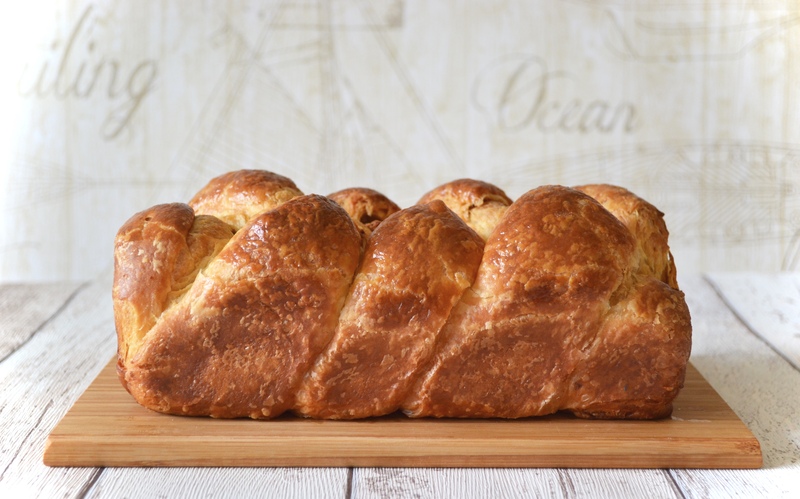 His recipe is for two plaited loaves filled with a Hazelnut paste that is made with sugar syrup and egg white (though the proportions of this can be varied to suit personal taste). I decided to make one plaited loaf (with hazelnut filling) and use the other 300g to make freeform swirls of dough (mostly in honour of my online friend who inspires me almost daily with her bread and enthusiasm for, and curiosity about it https://lavenderbakery.wordpress.com). So, lets begin. 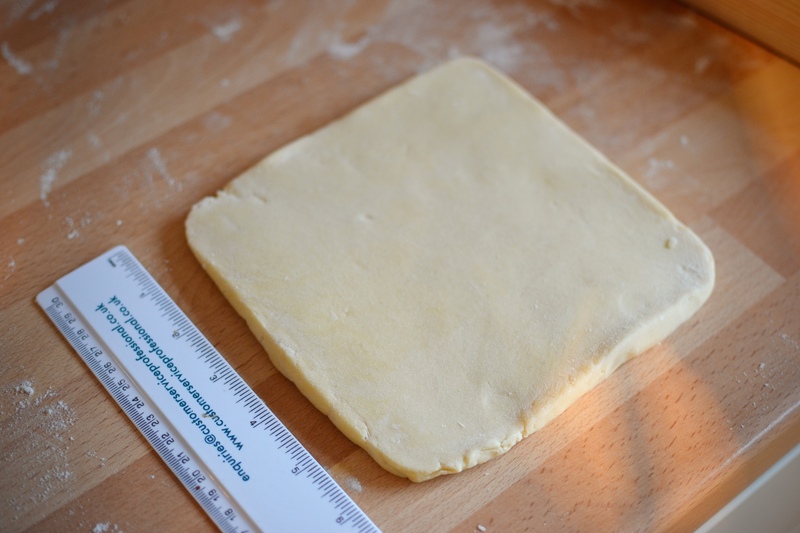 First I had to roll the 300g of chilled brioche dough out to a 6″ square. Then I had to place a 4.5″ square of chilled (but bashed and pliable) butter on top. 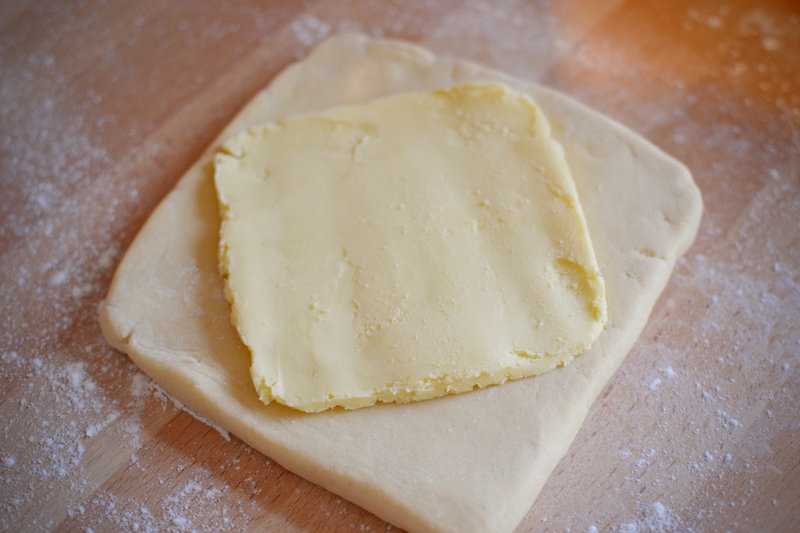 Then I folded the flaps of dough over the butter, sealing it carefully. Working gently I had to roll this parcel out to 16″ by 5″ and then fold to meet in the middle before folding again (a four-fold or full-book turn). Then it was off to the fridge for the dough, and the butter, to chill down again. 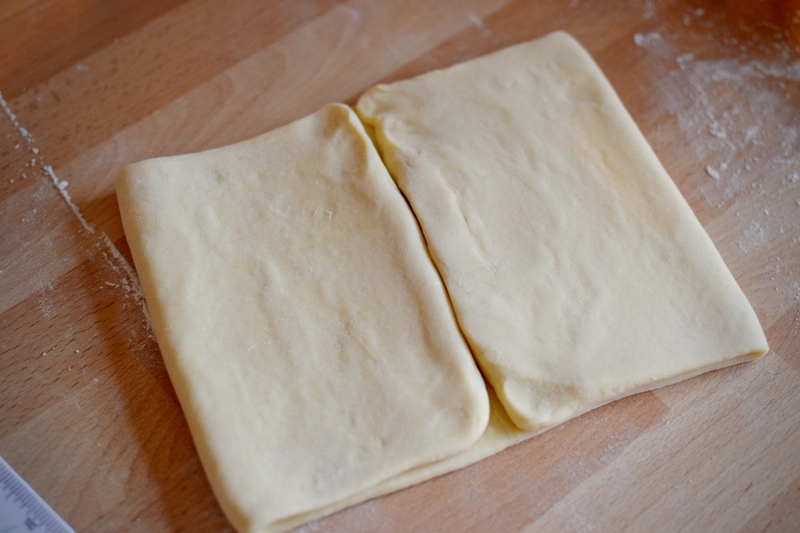 This dough was given another rolling out, this time to 15″ by 5″, then folded into three (a half-book turn), before returning to the fridge again to chill and rest. And so to the creation of the plaits. 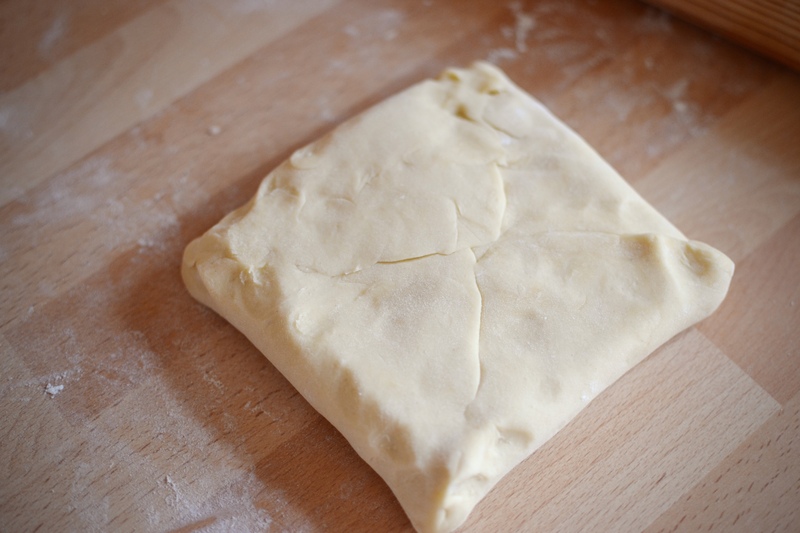 The chilled dough is rolled out to a 10″ square, then cut into three strips. 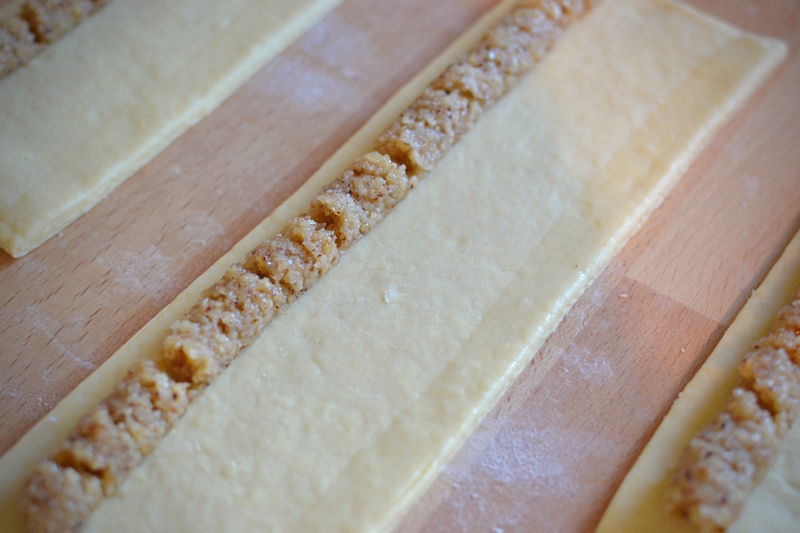 A thin line of egg wash is brushed along one side of each strip; and a line of the hazelnut paste is piped along the other. These are then rolled up and form the three strands of the plait. 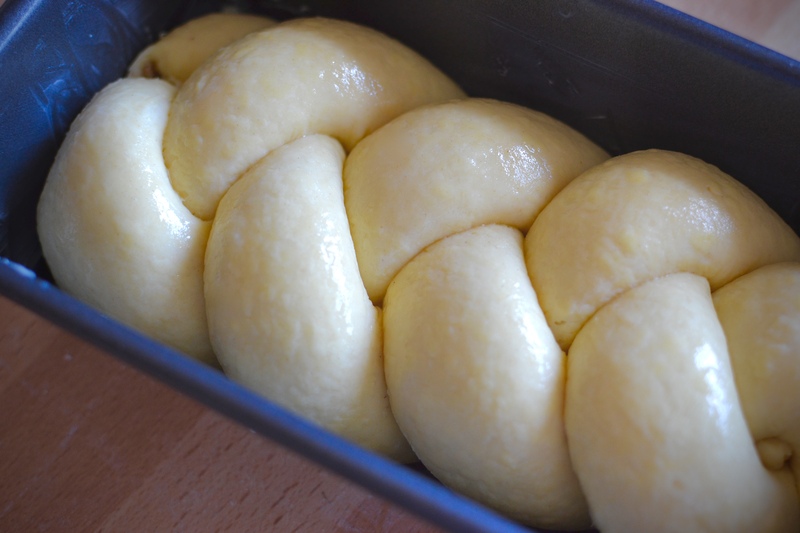 The plait is then placed in a buttered loaf tin and allowed to prove. This took over two hours for me. The loaf was egg washed then baked in a medium oven for 35 minutes and, boy, did it smell good when it was baking. It came out raised, puffed up and light as a feather. I have to say it was tempting to tear into it but I resisted, mainly so I could photograph the loaf in all its glory. But even I wasn’t prepared for its beautiful interior. All the laminated layers had burst open in the oven’s heat and created this ever so light brioche. 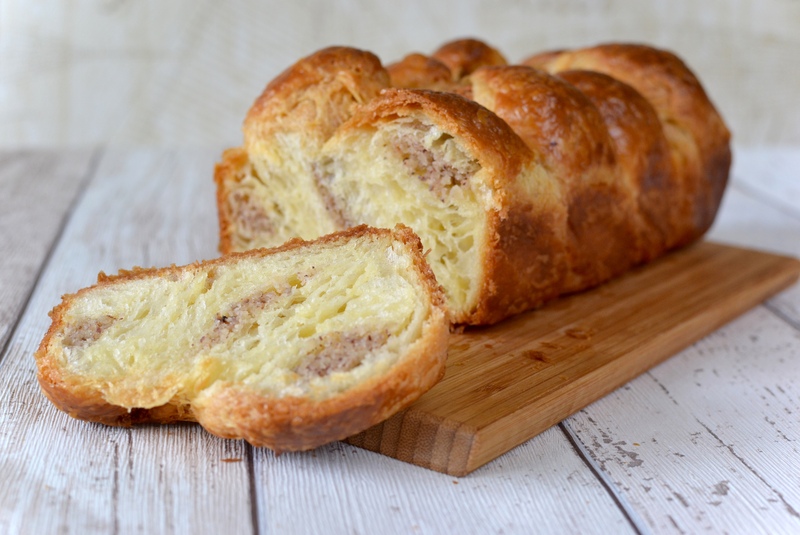 The hazelnut paste was just sweet enough and was a delicious addition to the brioche. I have seen a pistachio version on another blog and would very much like to try that. Plus I know that my kids would love a cinnamon sugar or chocolate version of this. I think there is great scope to develop the basic recipe to suit your favourite tastes. As for the other 300g of dough? 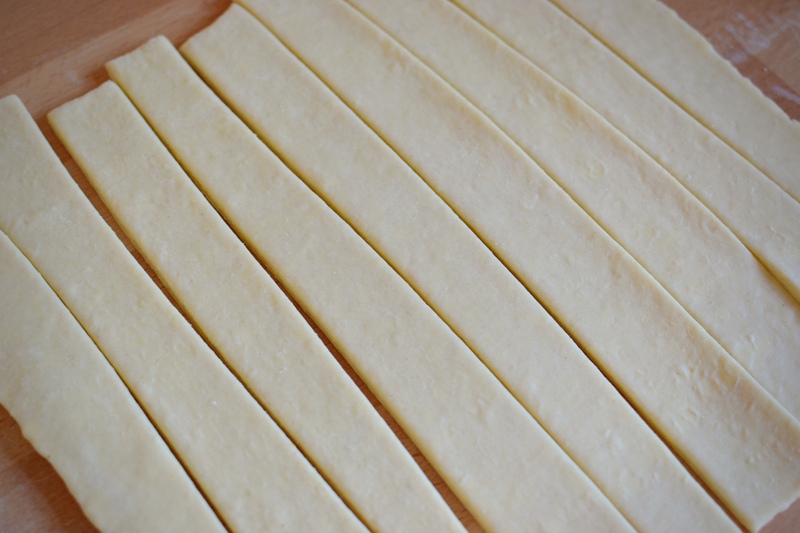 Like I said earlier, I rolled it out, cut it into 1″ strips, egg washed them and rolled them. I allowed these to prove for two hours before sprinkling with Demerara sugar and baking for about 20 minutes, and they turned out a treat. These were also delicious and proved great school snacks for my kids (and yes, we start back super early in Scotland). 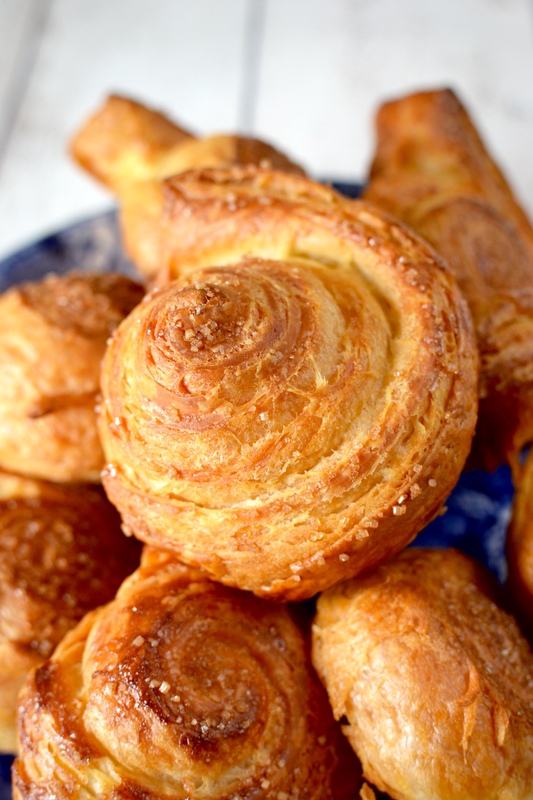 I would say that these are even more delicious than Croissants (ducks for fear of being struck down by a bolt of lightning from the patisserie gods) and I actually found them much easier to make. Perhaps because I was laminating 300g of dough at a time it felt easier. Perhaps I didn’t feel the same pressure of croissant layers, lamination and accuracy breathing down my neck whilst I worked away, not even sure what the end result was meant to look like. Perhaps I should just make them again to be sure. Very soon. 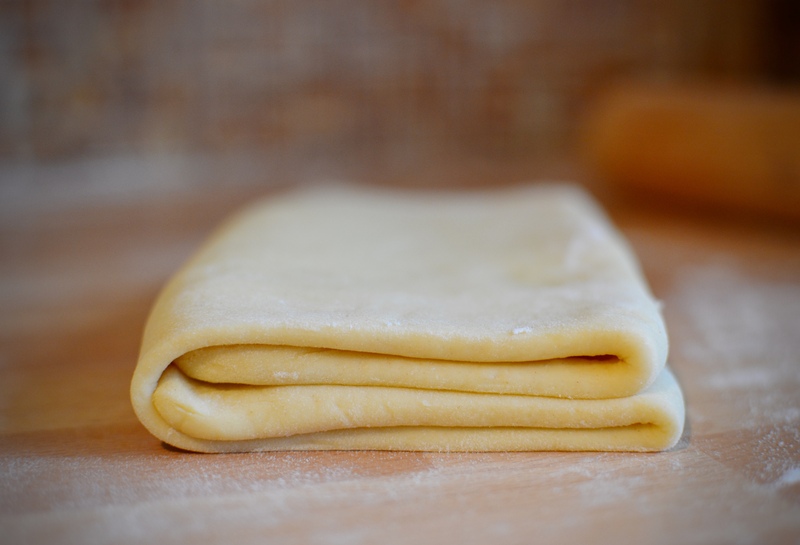 If you try making Brioche Feuilletée, or have experience already, please let me know your thoughts. And if you can’t be bothered with the extra work of making a filled and plaited loaf, just roll up the dough like I did. You won’t regret it. I am completely sold on this pastry. Lovely post, so interesting to see how you approached it. I love the idea of pistachio with this brioche too; like the amazing pistachio escargot from Du Pain et Des Idées, could be very good indeed!! Thank you, Michelle. 😊 Pistachio next time! It is a fantastic thing isn’t it? And your loaf looks beautiful – with a better, more even texture than mine 🙂 You must try the pistachio version, especially if you can get hold of some really good, green nuts. 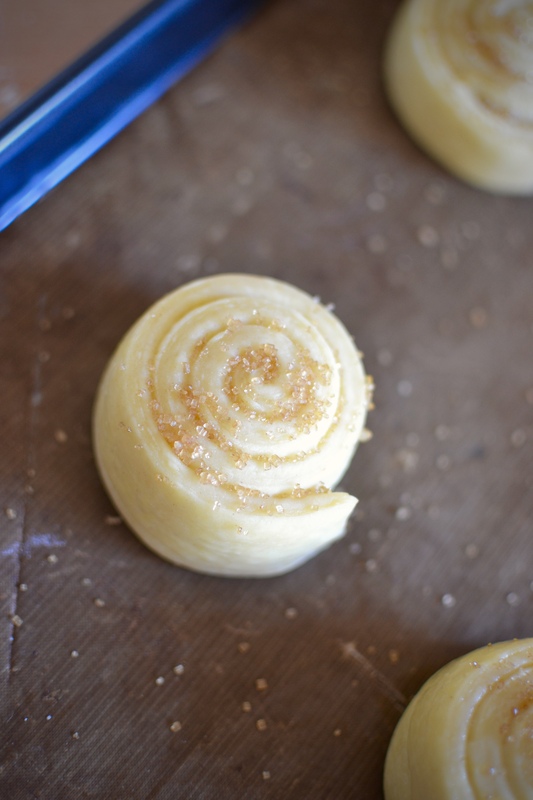 I like the sound of a cinnamon version and I love the look of those sugar coated spirals. You’ll just have to do the Brioche Diet! Previous PostBlondes do have more fun. Next PostAlways trust your instincts.